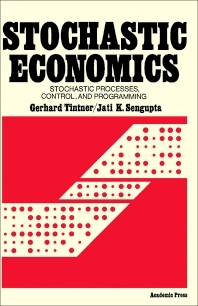 Stochastic Economics: Stochastic Processes, Control, and Programming presents some aspects of economics from a stochastic or probabilistic point of view. The application of stochastic processes to the theory of economic development, stochastic control theory, and various aspects of stochastic programming is discussed. Comprised of four chapters, this book begins with a short survey of the stochastic view in economics, followed by a discussion on discrete and continuous stochastic models of economic development. The next chapter focuses on methods of stochastic control and their application to dynamic economic models, with emphasis on those aspects connected especially with the theory of quantitative economic policy. Some basic operational problems of applying stochastic control, particularly in economic systems and organizations for problems such as dynamic resource allocation, growth planning, and economic coordination are considered. The last chapter is devoted to stochastic programming, paying particular attention to the decision rule theory of operations research under the chance-constrained model and a method of incorporating reliability measures into a systems reliability model. This book will be of interest to economists, statisticians, applied mathematicians, operations researchers, and systems engineers.